I have a serious love for enchiladas. Ironically enough though, I never order them out at restaurants. Since I have winning recipes for both enchiladas in red chile sauce and salsa verde enchiladas, I don't feel the need. But lately I have been wanting to come up with a recipe for a vegetarian enchilada recipe. I found this recipe and thought it looked promising, but I added some of my own tweaks and additions. I usually plan a few meatless meals per week, but I'm always unsure as to how they will be received by Joey. Every now and then he admits that he misses it, but not with these enchiladas. For enchiladas, these are surprisingly healthy and chock full of veggies: onions, bell pepper, zucchini, corn, spinach, and tomatoes. I think there are so many variations and vegetables you could add as well. And it uses a homemade red chile sauce that is very similar to the one from my favorite chicken enchiladas. The most interesting ingredient however, is the queso fresco (or feta if you can't find it). I loved the slightly salty and tangy addition to the filling. 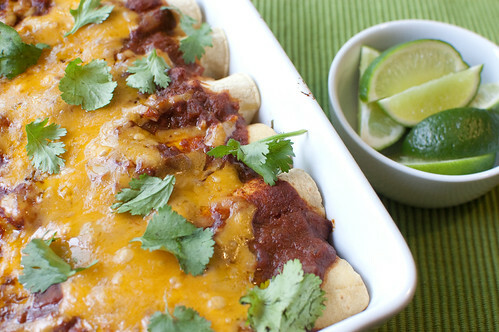 If you're looking for an enchilada recipe for Cinco de Mayo, these would be a great option - healthy, vegetarian, and most importantly, delicious! The only downside is that now when I make enchiladas, I have no idea which recipe to use! Preheat the oven to 450 degrees. Lightly grease a 9x13 inch baking dish. Mash half the beans in a bowl with fork until mostly smooth; set aside. Heat the oil in a large nonstick skillet over medium heat. Add the onion, jalapeno, and bell pepper and cook until softened and lightly browned, 5 to 7 minutes. Stir in the zucchini and cook until just tender, 3 to 5 minutes. Stir in the garlic and corn, and cook until just fragrant, about 30 seconds. Add the mashed beans and remaining black beans and cook until warmed through, about 2 minutes. Transfer the mixture to a large mixing bowl and stir in 1/2 cup of the enchilada sauce, queso fresco, cilantro, green chiles, spinach, and tomato. Season with salt and pepper to taste and set aside. Place the tortillas on a plate and cover with plastic wrap. Cook 30-60 seconds, until warm and pliable. Spread them out over a clean surface and top each one with a scant 1/3 cup of the filling. Working quickly, roll each torilla tightly and lay them seam-side down in the baking dish. Spray the enchiladas lightly with cooking spray, and cook 5-7 minutes. Pour the remaining enchilada sauce over the top, sprinkle with cheese, and bake an additional 5-10 minutes, until the enchiladas are heated through and the cheese has melted. Allow to cool 5-10 minutes, then serve, passing lime wedges separately. Heat the oil in a medium saucepan over medium-high heat. Add the onion and cook until softened, 5 minutes. Stir in the garlic, chile powder, cumin, and sugar, and cook, stirring constantly until fragrant, about 30 seconds. Stir in the tomato sauce and water, and bring to a simmer. Cook until slightly thickened, about 5 minutes. Season with salt and pepper to taste. I'm bad at planning meals without meat. It ends up being mac and cheese, heavy on the cheese. But these I have to try! I swear we share a brain. I was just looking at this recipe earlier this week, and put it on the menu for next week. Glad to hear your rave review! These sound amazing! I think I might make them for my mom for Mother's Day. I'm always looking for new meatless meals! They sound wonderful! I was just thinking about making this version in chicken, now I can't decide. They both look delicious! These sound so amazing. I love the America's Test Kitchen cookbooks! These look so tasty and healthy! I love enchiladas, especially when they have black beans!! This recipe was really good! My whole family enjoyed it. Thanks for another great recipe! Nikki, I'm so glad you liked them!! My kitchen is now a total mess, but I have a very happy tummy. This recipe was so easy and delicious to make! Thanks Josie! Made these yest. SO SO delicious. I'm making these tonight and have some leftover filling, do you think it would freeze well? Thanks!! Hi Lori, I'm sure it will freeze fine. Hope you enjoy! Thank you! These were fantastic and there's plenty to freeze!